View More In Disposable Cookware. Cooking is fun and simple with Dobi's disposable full-size deep pans. - Reheating in the oven And Much More! The pans are disposable and recyclable and serve great when you want have a big party to cater to or when you wish to avoid the mess that comes with cooking in non-disposables. We recommend lining the pans with unbleached parchment paper when it is permissible (parchment paper is usually oven safe for use below 420F/215C but be sure to check each manufacturers guidelines). Read the "Important information" section below for further detail. - Support pans bottom surface when lifting and transporting. - Clean pans before use. - Do not use in microwave. - Do not reuse pans. 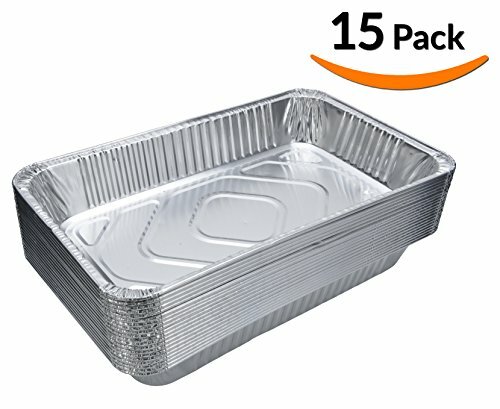 DURABLE ALUMINUM FOIL PANS - Sturdy pans, great for cooking, roasting or heating in the oven, keeping food warm in buffet sets or just serving straight to the table. PERFECTLY FITS CHAFING DISHES - Pans are ideally sized to be comfortably placed in full size steam table pans, chafers & buffet serving kits. CONVENIENT AND AFFORDABLE - Perfect for when having guests over or throwing a party. Cooking for family and friends has never been easier! If you have any questions about this product by DOBI, contact us by completing and submitting the form below. If you are looking for a specif part number, please include it with your message. DOBI (20-Pack) Toaster Oven Pans - Disposable Aluminum Foil Toaster Oven Pans, Standard Size - 8 1/2" x 6"